A case of environmental justice success in the USA; the campaign WE ACT forced the US government to address the issue of water treatment in the North River in Manhattan. Since it began operating in April 1986, the North River Sewage Treatment Plant’s noxious emissions has been causing respiratory problems, among others, in the West Harlem community. The plant treats 125 million gallons of wastewater during dry weather but can handle up to 340 million gallons during wet weather . It is owned and operated by the New York City Department of Environmental Protection (DEP) and serves about 550,000 people on the west side of Manhattan . On Martin Luther King Day, January 15, 1988, a group known as the “The Sewage Seven” were arrested for holding up traffic at 7 a.m. on the West Side Highway in front of the Plant. This group was comprised of the then West Harlem Democratic District Leaders Peggy Shepard and Sutton, then-state Senator and Governor David Paterson, former Council member Hilton Clark and three others. 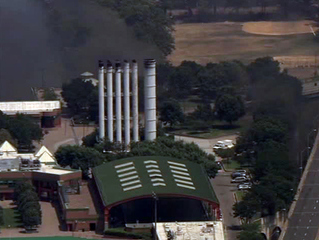 Across from the plant, community residents held up traffic on Riverside Drive carrying placards and wearing gas masks . By the time this mobilization and civil disobedience protest occurred (3 years into the Plant’s operation), residents were already blaming the site’s air pollution for increasing an already high incidence of respiratory issues in the area, including asthma . Air quality is a concern for the West Harlem community because of the epidemic and rising rates of asthma. Estimates are that asthma rates are five times the national average, with many children under the age of thirteen having this disease. As of 2010, West Harlem is over 67 % Hispanic and African American . Despite protests from West Harlem residents who were not adequately informed about the proposal, the Plant was permitted in 1968 and construction began in 1972. The design of the plant was adjusted in the 1970s and early 1980s to save money and in 1979, the U.S. Environmental Protection Agency issued a finding of no significant impact for the facility, meaning no environmental impact statement would have to be done . Testing by the DEC later found that the plant was producing 28% higher than allowed levels of hydrogen sulfide, a compound that deprives human cells of oxygen. Since many local residents suffered from sickle cell anemia, a condition where cells have insufficient oxygen, this raised alarm among community leaders . The community based organization, West Harlem Environmental Action (WE ACT), was founded amidst anger and frustration surrounding the plant operations and was developed to spearhead an organizing and legal campaign, as well as to act as a community watchdog to monitor the plant . A key elected official began to respond to community concerns about the plant’s operation by hiring an environmentalist to research and submit a study of the operation of the plant. This study resulted in a document that armed residents with facts and figures necessary to fight this problem and gain greater media credibility . WE ACT met with numerous City and State officials through the years in an effort to exact a plan of action for correcting the plant’s operational flaws. However, it took a lawsuit to make the City respond. In 1992, WE ACT, along with the Natural Resources Defense Council (NRDC), sued the city and its Department of Environmental Protection . 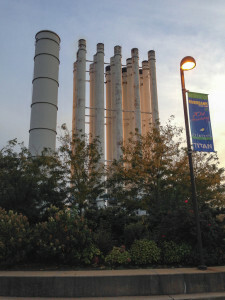 This was the first lawsuit in the city’s history in which it had been sued for creating a nuisance from smells and it charged that the smells were the result of “intentional, unreasonable, negligent, reckless, and abnormally dangerous siting, design, construction, and operation of the plant” [6 pg. 84]. WE ACT reached a settlement of its lawsuit against the City in December 1993 for operating the Plant as a public and private nuisance. This settlement called for the establishment of a $1.1 million fund to address community concerns related to health, environment and service delivery . Although WE ACT did not stop the plant, it did force the city to spend $55 million to address the issues, including the noxious odors from the plant . Seven years after the plant opened, Riverbank State Park was built on top of the facility as a concession to the community in 1993. Peggy Shepard of WE ACT noted that gentrification in the area and the number of people who visit the park from outside the neighborhood made it difficult to maintain awareness about the plant . This park provides a wide array of services including an Olympic-sized swimming pool, a covered skating rink that turns into an ice rink, an 800 seat cultural theater, a 2,500 seat athletic complex with a fitness room, and a football/soccer field. One park visitor stated that she didn’t even know there was a wastewater treatment plant there and that there aren’t any signs signifying that . Plant was producing 28% higher than allowed levels of hydrogen sulfide . Why? Explain briefly. While the plant was not closed, WE ACT forced the city to spend $55 million to address the issues, including the noxious odors from the plant. Additionally, the settlement provided them with $1.1 million to fund their work and address community concerns related to health and the environment.